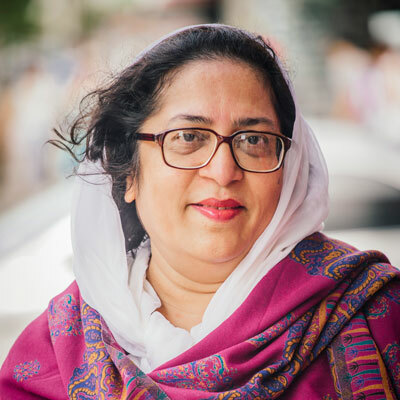 BORDC’s Patriot Award for November 2015 goes to Shahina Parveen, an organizer with DRUM-South Asian Organizing Center. Shahina had no experience with activism or organizing work before 2004. That is when her son, Shahawar Matin Siraj, was arrested after being targeted and entrapped by the New York Police Department for an alleged plot to attack the Herald Square subway station. In 2007, he was sentenced to 30 years in prison. The day after his sentencing, immigration officials placed Shahina, her husband, and her daughter in detention. They were released following a community campaign led by DRUM, and Shahina went on to become the first member of a targeted family to go public with her story. This was a brave decision on her part, since she was undocumented at the time. Today, Shahina is a leader in DRUM’s work on issues including holding law enforcement accountable for their actions, fighting against detention of immigrants, and working for immigrants’ rights. She interacts with black mothers whose children were killed by police, Latina mothers whose children were forced to cross the border, and Muslim mothers whose children have been entrapped and imprisoned. She brings these people together, helping them to help themselves and one another. Shahina does this despite her limited proficiency with the English language. In June 2014, Shahina was a member of the “War on Terror–Criminalizing Communities, Suppressing Movements” panel at Left Forum, where she spoke about the effects that her son’s arrest and imprisonment have had on her family. She also spoke about her efforts to stop the racial profiling responsible for her son’s situation. For a detailed account of Shahawar Matin Siraj’s story, see pages 33 through 37 in the report Targeted and Entrapped–Manufacturing the Homegrown Threat in the United States, 2011, published by Prison Legal News. In April 2015, South Asian Americans Leading Together (SAALT) honored Shahina with a ChangeMakers Award for her efforts to “significantly advanced social justice among South Asians in the U.S.” Shahina also works as an organizer with the National Coalition to Protect Civil Freedoms (NCPCF), where she helps families like her own. The Bill of Rights Defense Committee, Defending Dissent Foundation, and DRUM are all member organizations of the NCPCF. Her own unfailing bravery has earned Shahina Parveen the BORDC Patriot Award for November 2015.